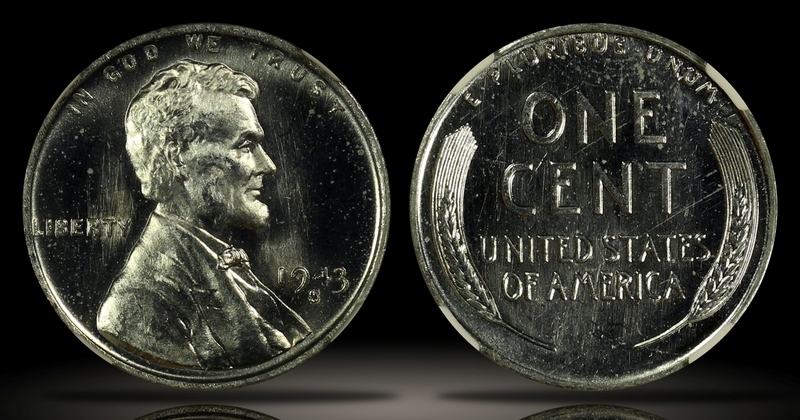 Zinc-coated Steel Lincoln Cents, which were issued in 1943 because of the increased demand for copper in connection with World War II, have been popular among collectors almost since the day they were issued. 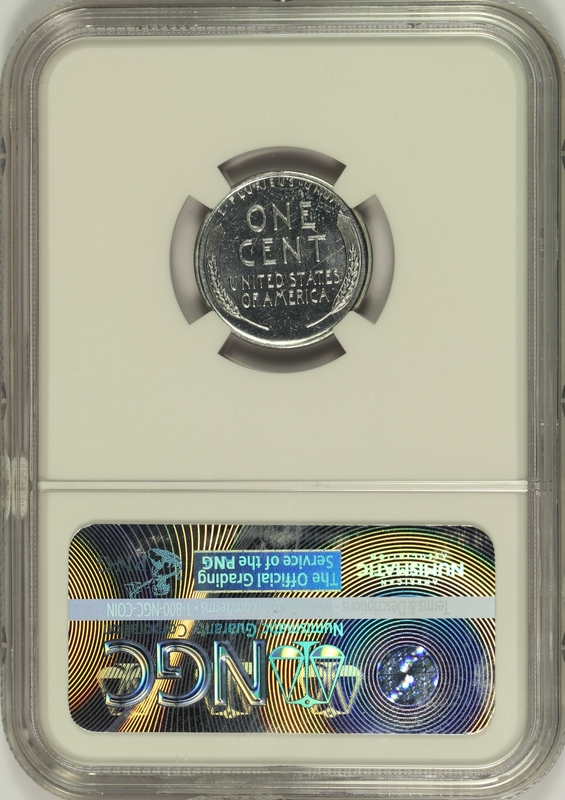 This 1943-S Lincoln Steel Cent has been graded MS67PL by NGC and is encapsulated in one of the newer-style edge-view holders. 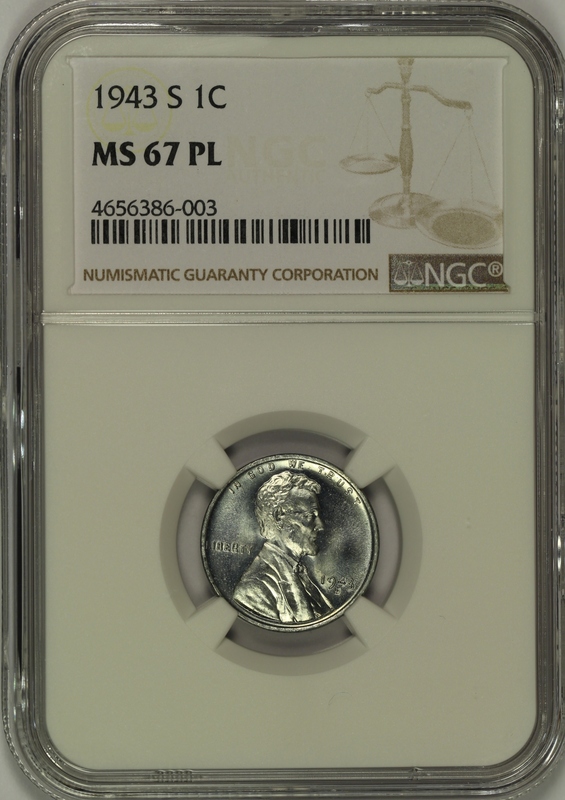 Although there are many examples of the wartime Lincoln Steel Cent in the MS67 grade available on the market at any given time, only 9 examples have been given the MS67PL grade by NGC with none grading higher. 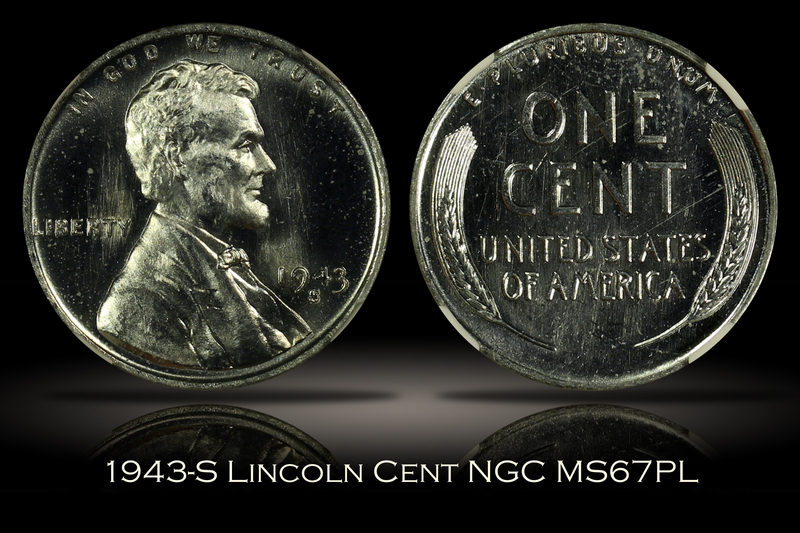 In fact, NGC has graded only 33 steel cents as prooflike in any grade. There are obviously more steel cents out there that are semi-prooflike and we have sold several of them for strong premiums. However, an example with the prooflike designation is extremely scarce. Since no proof examples of the steel cent were minted, coins like this are in high demand, especially among type coin collectors. High grade steel cents will typically have a more flat or satin finish look to them with minimal flash. The coin offered here is very flashy with strong prooflike fields. The prooflike fields on both sides are also full of die polish lines that are evident of the freshly worked dies that gave rise to the proof like appearance of this coin. The devices of this coin also show relatively strong cameo contrast that is not typical on a steel cent. Only a couple of small marks are noticed under a close inspection and there is some light spotting in the fields which is exaggerated in the photos and is hardly noticeable when viewed in hand. A rare example of the prooflike Lincoln Steel Cent with superb eye appeal. Because of the difficulty in capturing the overall look of the coin in a single image, I have also included a short high-definition video of the coin towards the bottom of this listing in an attempt to give you a better idea of what this coin will look like in hand. Please note that you may need to adjust the video quality to 1080p and may need to increase the size of the video to full screen in order to see the coin in maximum detail.